The Fourth of July wouldn't be a holiday without a parade. You'll find a Fourth of July parade taking place every year somewhere near Albuquerque. It's possible to make a morning of taking in a parade, and still having enough time to see a fireworks display. If being in a parade is what you want to do, it's always possible to participate in a parade by signing on early enough, and the Rio Rancho parade encourages families to bring their decorated bikes and join in the fun. Find more Fourth of July events. The parade begins at Target Road at 10 a.m. and proceeds south through downtown Corrales to La Entrada Park. You can see the whole parade anywhere along the route, beginning at Corrales Elementary School south to Double S Road. La Entrada Road will be closed at Corrales Road. Parking is available at the Rec center. After the parade, enjoy Family Fun Day at La Entrada Park. There will be food, local information and more. Parking in the downtown area is limited, so arrive early. The theme for this year's Fiesta de Las Vegas is "We Are United Behind Our Culture." The six-day event features a parade, a memorial run, a memorial to veterans and plenty of live performances. The parade begins at 9 a.m. on June 30, followed by entertainment which lasts through the evening and into the weekend, through July 4. 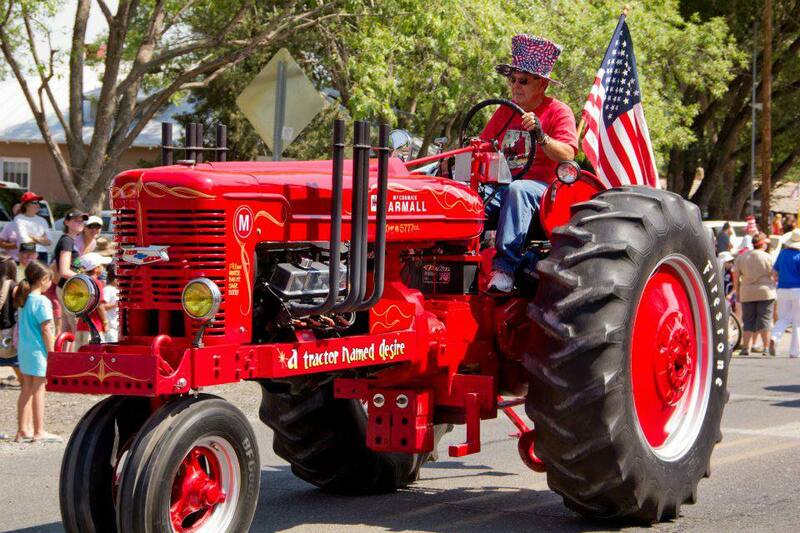 The Fourth of July parade in Los Lunas begins at 9 a.m. at Lambros Loop and ends at Don Pasqual Road. This parade always has a lot of horses, and plenty of old fashioned fun. There will be decorated firetrucks, floats, and tons of candy thrown out to the kids. Where: Begins at Main Street and Lambros Loop (the Y) and goes through Los Lunas to Main Street and San Pasqual. Mountainair celebrates the spirit of America at its annual 4th of July Firecracker Jubilee. The fun begins with a community parade along Highway 60, followed by Fun at the Monte Alto Plaza & Newly Cleaned Burn Area for kids and street vendors. It all ends with a firecracker display and community dance. The annual Jubilee takes place at Chavez Memorial Park. The city of Rio Rancho has a parade every year to celebrate this holiday. Get out to the parade to see classic cars, military organizations, but most importantly, the bike parade! Children and their parents are encouraged to decorate their bikes and join the parade and the bike decorating contest. Prizes for the best bike decorations will be awarded in different age categories: 5 to 7, 8 to 10, and 11 to 15. After the parade, a ceremony will mark the adoption of the Declaration of Independence, at Rio Rancho Veterans Monument Park off Pinetree Road. The ceremony will begin at 11 a.m. and will have several speakers. The Fireworks Extravaganza is also happening on July 4 in Loma Colorado Park, from 6 p.m. to 9 p.m.